I’ll be setting up a coupon code for pre-order customers that will take off the pre-paid amount from the total and also the customary 10% for GC members so you get full advantage of current discounts. The SMP Tone Grenade uses a 12AU7 tube for a clean boost all the way up to a mild bluesy overdrive. This pedal will add that ”tube tone” to any solid state amp and gives additional rich harmonics. Nothing fattens up your sound like a Tone Grenade! 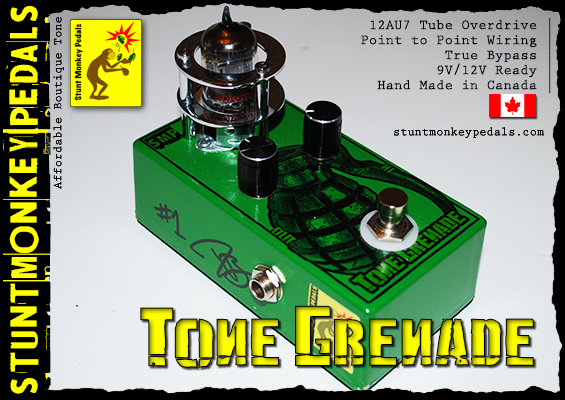 The SMP Tone Grenade runs off any 9 volt Boss style negative tip adapter. At Stunt Monkey Pedals, we recommend the 9V Visual Sound One-Spot for use as it will provide plenty of clean power to this and many other pedals all from one small adapter. For more headroom, a 12V adapter can be used. You”ll get more volume but less gain. Never exceed 12V as any more than this will severely impact tube life. P.S.S: They also come stock with the ‘Smith Mod’ for a different Gain option (a microswitch beside the tube that’s not in the picture).